I have Christmas on the brain so a gingerbread story seemed just the ticket. 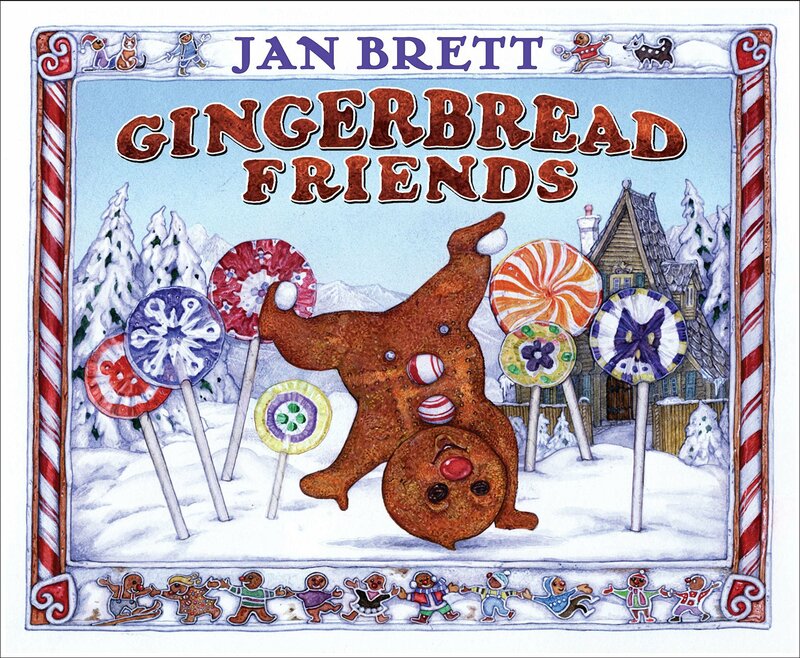 GINGERBREAD FRIENDS by Jan Brett inspired my Messy Play class for two and three year olds. The Gingerbread Baby lives with a little boy named Mattie and loves him dearly, but when Mattie goes off to play with friends, the Gingerbread Baby feels lonely and sets off to make friends of his own. Into the village goes the Gingerbread Baby to the bakery where there are many figures like him, but they are all still as stone. After several disappointing friendship attempts and an unwelcome encounter with a mouse, the Gingerbread Baby races home. At home, the Gingerbread Baby spots a cupcake trail leading to a gingerbread land full of friends cooked up by the best friend of all, Mattie. Scoop and pour the salt, flour, and water into the mixing bowl. Mix the ingredients together with your hands to reach a dough consistency. Put your dough onto wax paper sprinkling additional flour if sticky. Play with the dough, shape the dough, squeeze the dough. A rolling pin can be used to flatten the dough, but with this age group we decided to smoosh with our hands. It is Messy Play after all. Use cookie cutters to make friends for the Gingerbread Baby or other fun shapes. A straw works well to add a hole to your design, creating an ornament. Leave dough to dry out or bake in a 200 degree oven to speed the process. When the salt dough is thoroughly dry it can be painted.